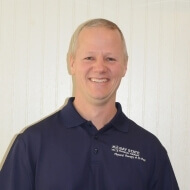 Chip has been working as a physical therapist focusing mainly on orthopedic-based injuries and cases since 1999. His treatment approach involves active patient participation and education, combined with sound functional therapeutic exercises and manual techniques designed to return patients to normal functioning of daily activities. Chip is credentialed in mechanical diagnosis and therapy using the McKenzie Approach. This is a method of treatment that is internationally recognized in the treatment of back, neck and related extremity pain. McKenzie therapists closely evaluate and re-assess each patient, trying to identify a mechanical cause of symptoms. Once identified, a mechanical treatment program is implemented. The goal of the McKenzie system is for patients to gain an accurate understanding of their condition and to be able to perform active exercises to reduce and eliminate symptoms and recover function. He is also FMS (Functional Movement Screen) certified and SFMA (Selective Functional Movement Assessment) Level 1 certified through Functional Movement Systems.